Select Slide Size16" 18" 20" 22" 24" 26" 28" 30"
Select Shaft Size36" 48" 72"
Note: This product will appear as three (3) separate items in your shopping cart. 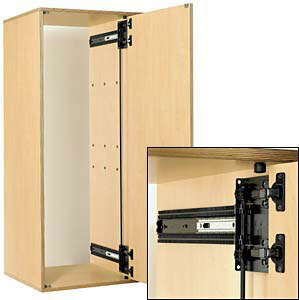 The Knape & Vogt 4x4 Pocket Door™ Slide is ideal for use in large entertainment and home theater cabinets. Designed to hold over-size doors up to 75lbs. x 72" high. The dual rack and pinion system virtually eliminate door sag, speeding installation and minimizing adjustment. Note: Three items (slides, 2 pair of hinges and a shaft) will be added to your shopping cart per each set ordered. One set will accommodate one door. NOTE: Slides lose 4in. (102mm) on installation; slides should be 4in. 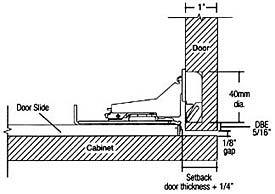 (102mm) longer than door width for door to fully recess into cabinet. This item has been blogged! Recommended Use: Designed for large entertainment and home theater cabinets. Mounting: Mounts directly to cabinet side. 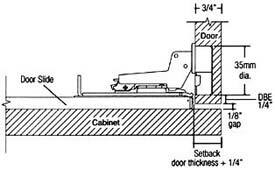 Features: Rack and pinion design virtally eliminates door sag. Metal ball retainer holds three bearings per inch for smooth and quiet operation. Multiple hinge options allow for a wide variety of applications. Slide Action: Progressive movement on precision steel ball bearings. Standard or Free-Swing Inset - For frameless or face-frame inset applications with 3/4in. thick door. 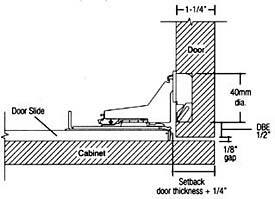 NOTE: To use in face-frame applications, the slide must be blocked out from the side panel of the cabinet, as shown in the FACE-FRAME illustration below. 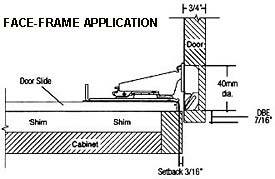 Partial Overlay - For frameless or face-frame applications with 3/4" thick door. Maximum overlay with full hinge adjustment is 13/32in. 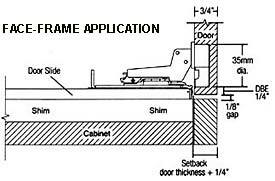 NOTE: To use in face-frame applications, the slide must be blocked out from the side panel of the cabinet, as shown in the FACE-FRAME illustration below. Thick Door Inset - Frameless, inset application with 1in. thick door. 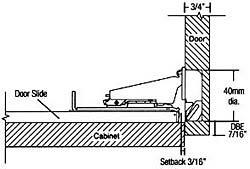 Rear corner of door may be beveled at 45° to use door sup to 1-1/4in. thick. Extra Thick Door Inset - Frameless, inset application with 1-1/4in. thick door.